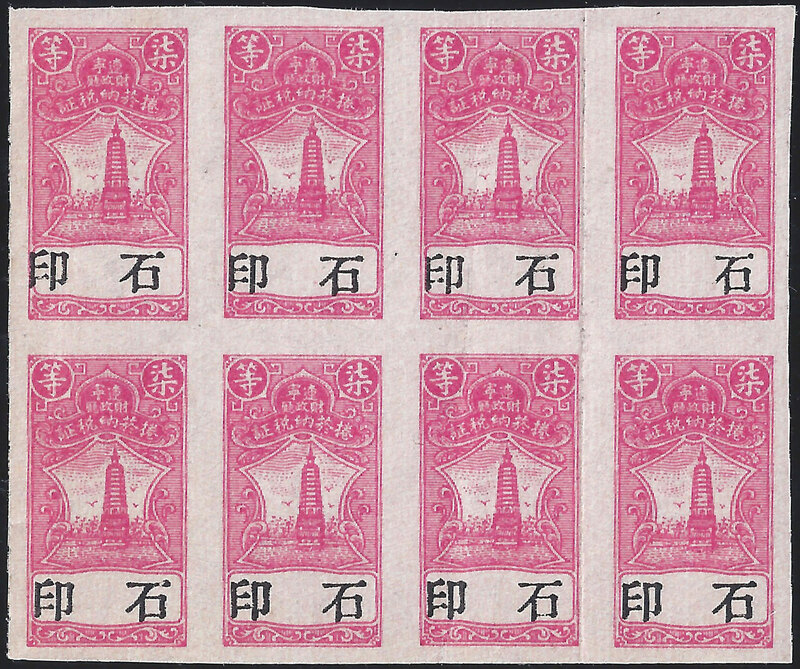 Listed below are some regional stamps used in Manchuria before the birth of Manchukuo. Date unknown. These revenue stamps seem to have been used to collect a form of parcel Post Tax although some sources list them simply as parcel stamps. Four values are known to me, 5c brown, 10c red, 20c blue and 50c olive (below), other values may exist. The banner reads 东三省邮包税票 Eastern 3 Provinces Postal Package Tax, the provinces being Kirin, Liaoning and Heilungkiang. 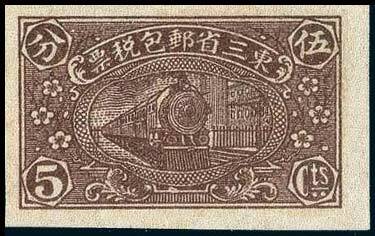 The design features a steam locomotive with sprigs of cherry blossom this is the same for each value. 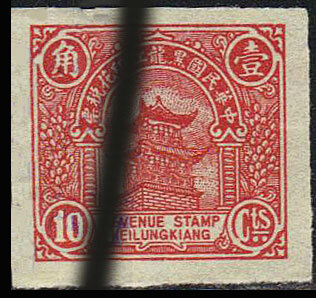 The printer is almost certainly the same as the producer of the Fengtian Opium Destroy Certificates, the paper and processes used is identical it is therefore likely that these stamps were printed in Mukden. Design size 32mm x 19.5mm, Litho printed on thin, white or buff, un-watermarked paper. The 20c Green is not normally listed as part of this set so it is possible that this is a proof copy. 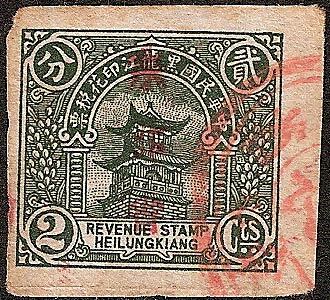 The province of Heilungkiang also issued a special revenue tax stamp. 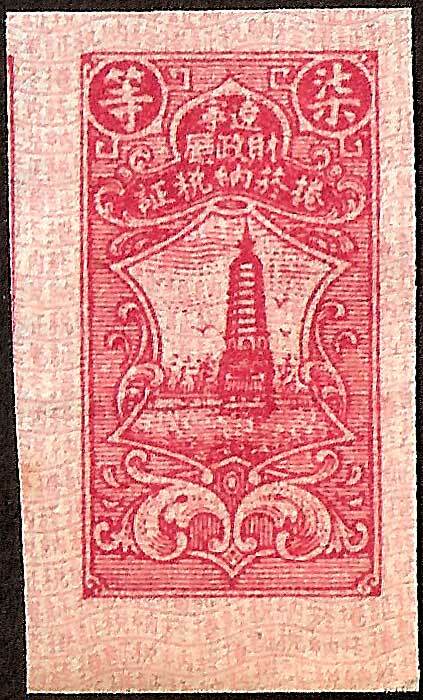 The Chinese banner above the gate reads (right to left), Republic of China, Heilungkiang, Revenue Stamp. 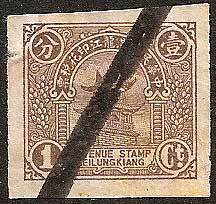 Issued c1922 The Heilungkiang Revenues. 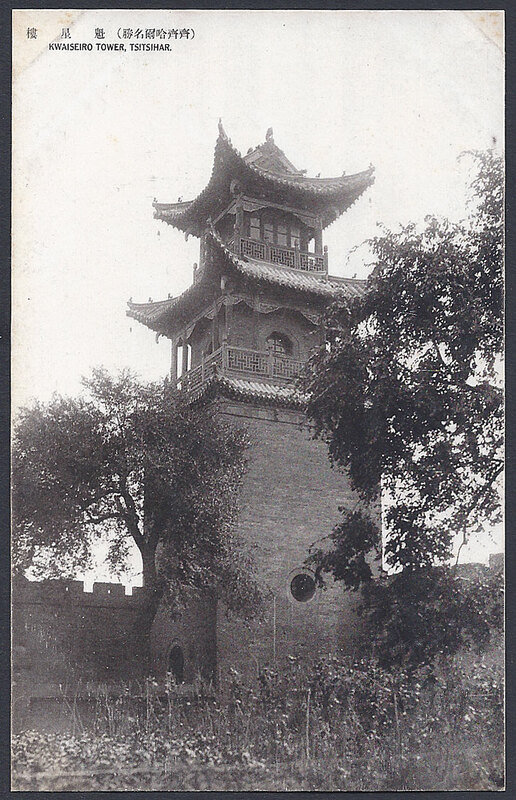 The image shows the Kwaiseiro Tower in Qiqihar (this is the Japanese name from the postcard that allowed me to identify the landmark, I am seeking a Chinese name for it). The set is comprised of 1c Brown (above), 2c Green, 10c Red. Size 21mm x 20mm, always Imperf, thin white paper, no watermark. 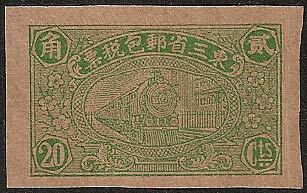 The 2c stamp shown above is overprinted in soft red 東北省 meaning "North East Province". Issued c1930 This is a tax paid cigarette revenue it does not show a value. The stamps would be stuck across the closure of a cigarette packet so that the stamp was torn when the customer opened the packet; the purpose being to show that tax had been paid on the tobacco. The stamps had different colours for the various grades of tobacco, these were -1st Class - Red, 2nd Class - Light Blue, 3rd Class - Brown, 4th Class - Dark Blue, 5th Class - Burgundy, 6th Class - Green, 7th Class - Pink, these colours were also used for taxing cigars. 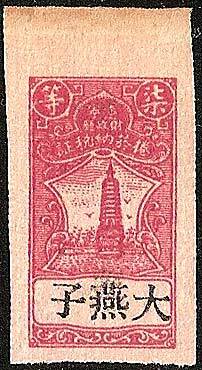 A similar design exists with a blank panel below the pagoda overprinted 大燕子, this translates as "Big Swallow" it could be a brand name or the name of a town. 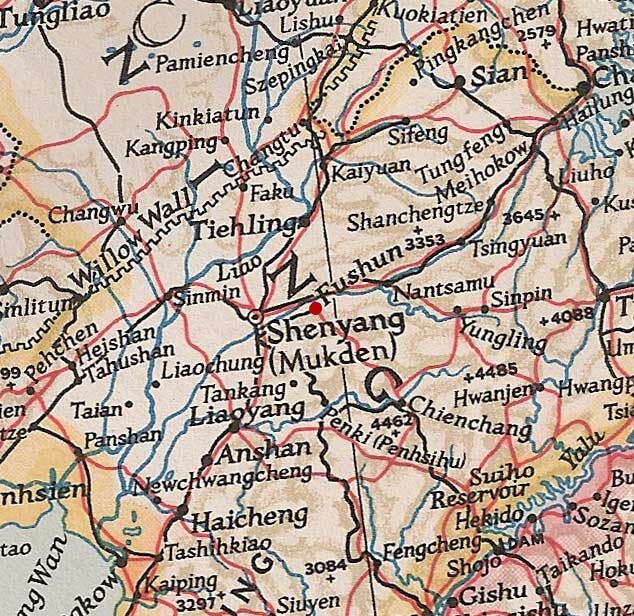 The top two characters in the central cartouche read 遼寧 (Liaoning), today the province is called Xingcheng. 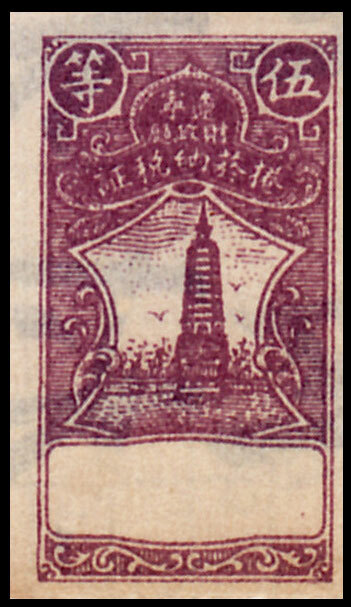 This block reads 右印 Lithograph. The reason for this is unclear. Design 13mm x 23mm, Engraved on thin, white, un-watermarked paper - as a security measure the paper has been pre-printed with tiny characters in wavy lines. The number of stamps per sheet is unknown. Always imperf, no gum. 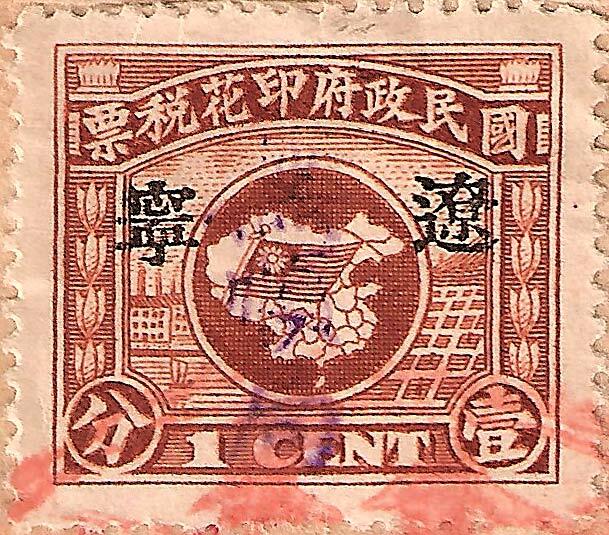 This is a revenue stamp based upon an image of the map of China covered by the Nationalist flag. Behind the map and flag are images showing industry and agriculture. 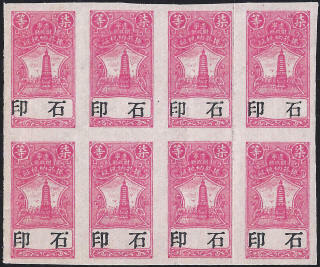 These stamps came into use in 1927 and were re-printed in 1928. (The original printing had five white lines running the full length of the flag horizontally, the reprint has four). The set has the usual five values 1c brown, 2c green, 10c red/orange, 50c mauve, $1 blue. Engraved, size 21 x 18mm, Perf 14. 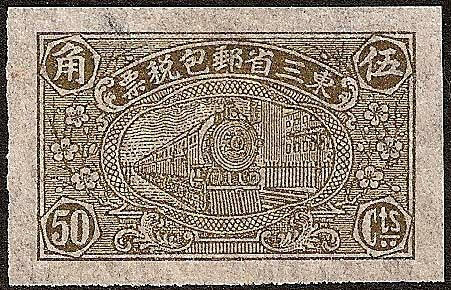 This version with the black overprint 遼 寧 Liaoning did not appear until 1930 and only appears on the reprints. 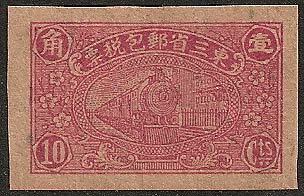 These stamps sometimes has further control chops added and in this instance a feint violet 抚顺局 Fushun Bureau chop can be seen. 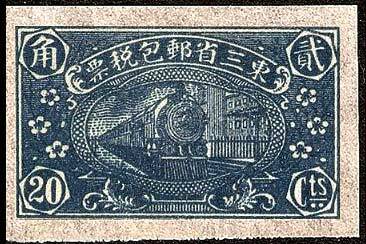 This version with the black overprint 黑龍江 Heilungkiang did not appear until 1930 and only appears on the reprints.